Laurel Ewell has gained a reputation in Maryland as an outstanding teacher of young flutists. Many of her students have placed in all-state orchestras and bands and performed as students with the Baltimore Symphony Orchestra. Outstanding teacher of young flutists in Baltimore County. Well-educated musician, with a Doctor of Musical Arts in peformance. Expertise preparing students for the Trinity School of Music examinations in flute and music theory. Laurel Ewell received her Doctor of Musical Arts from West Virginia University and her Bachelor of Arts and Bachelor of Music degrees from the University of Washington. She held the position of Assistant Principal and Second Flute of the Hong Kong Philharmonic. She also served as flute instructor for the Chinese University of Hong Kong and the Hong Kong Academy of Performing Arts. Dr. Ewell has performed with the West Virginia Symphony, Mid-Atlantic Symphony, Lyric Mountain Music Festival, and the Laureate Wind Quintet, resident wind quintet of West Virginia University. Her other chamber performances have included recitals for the International Double Reed Society, the Eastern Conference of the Music Teachers National Association, the Tuesday at Towson recital series at Towson University and the Sundays at Central concert series in Baltimore. In 2003 her performance of Reminiscence for solo flute by composer JianJun He was included on a recording by the Ningxia Da Di Video & Audio Publishing House. Dr. Ewell’s dissertation titled “A Symbolist Melodrama: The Confluence of Poem and Music in Debussy’s La Flûte de Pan” won the DMA/PHD Dissertation competition for the National Flute Association in 2006. Currently, Dr. Ewell lives in Baltimore, Maryland where she teaches flute and music theory for the Maryland Performing Arts Institute. 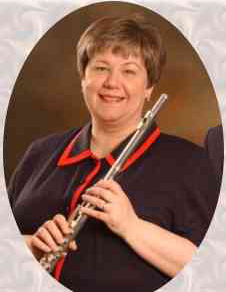 She is also a founding member and performer with the Baltimore Flute Choir. Further information may be found at www.laurelewell.com. Instructor in aural theory for music majors. The Lyric Mountain Music Festival presented a series of summer orchestra concerts in the Laurel Mountains of Pennsylvania. Piccolo and flute in summer concert series. Towson, Maryland. Performed the Beethoven Trio (flute, bassoon, piano) with Reynaldo Reyas and Terry Ewell and Night Whispers (flute, bassoon). Greensboro, North Carolina. Chamber music recital featuring music for flute and bassoon, including the world premiere of Night Whispers by Dr. Jonathan Leshnoff. This is the resident wind quintet of West Virginia University. Grantsville, Maryland. Concert of flute and harp music with Christine Mazza. Morgantown, West Virginia. Chamber music concerts featuring flute & harp, a trio of 2 flutes and bassoon and a flute quartet. He Jianjun. Reminiscence. Ningxia Da Di Video & Audio Publishing House. 2003. Featured in performance of Reminiscence for solo flute. Brahms, Johannes. Hungarian Dances. Hong Kong Records. Kenneth Jean, conductor. March. Hong Kong Records (6.220114). 20‑21 Jan. 1983. Varujan, Kojian, conductor. Chinese TV Themes. Varujan Kojian, conductor. Colorful Clouds: The Hong Kong Philharmonic Plays Popular Chinese Classics. Hong Kong Records (6.240090). 19‑20 Jan. 1982. Kenneth Jean, conductor. Kwan, Michael. Michael Kwan Live in Concert. Philips (6642 048). 1982. Records (6.220297). Yoshikazu Fukumura, conductor. Under the Silver Moon: The Hong Kong Philharmonic Plays Popular Chinese Classics, Vol. 2. Hong Kong Records (6.240279). 7‑10 May 1984. Kenneth Jean, conductor. World of Wonder Arts and Humanities Series at West Virginia University, a program linking the College of Creative Arts and Monongalia County schools. Duties involved the development, administration, and performances of various programs within the College of Creative Arts and throughout the Monongalia County schools. Morgantown, West Virginia. Conducted and coordinated performances in several local concert series.